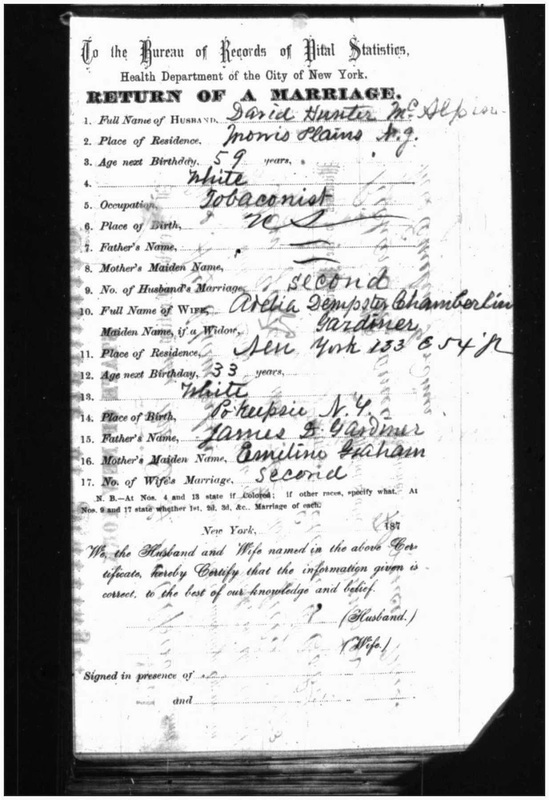 My second great grandfather, David Hunter McAlpin, married three times: to Frances Adelaide Rose, mother of his ten children, who died in 1870, widow Adelia Demster (Gardiner) Chamberlin, and widow (and sister of his first wife), Cordelia Maria (Rose) Shackelton. I recently obtained the marriage license for his second marriage to Adelia. New York, New York, Manhattan Marriages, FHL Microfilm 1561969, Certificate No. 4474. D. H. McAlpin and A. D. Chamberlin, July 16, 1873. Handwritten entries are in blue; my comments are [in brackets]. 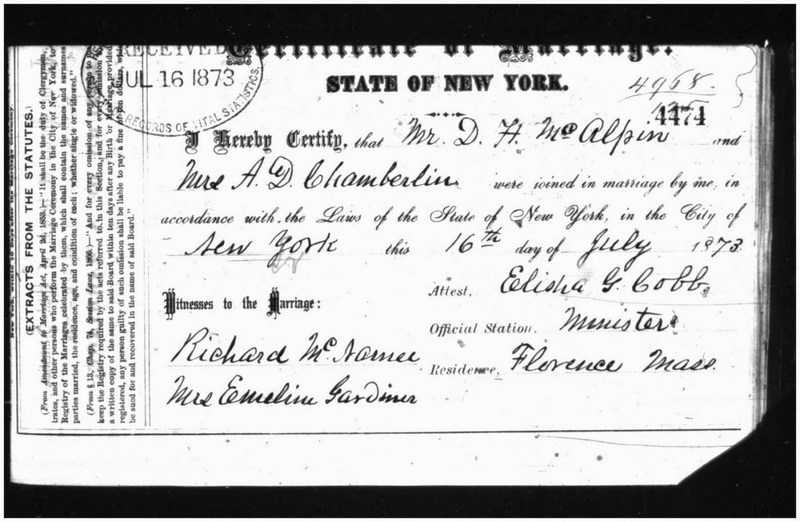 I hereby certify that Mr. D. H. McAlpin and Mrs. A.D. Chamberlin were joined in marriage by me in accordance with the Laws of the State of New York, in the City of New York this 16th day of July 1873. Health Department of the City of New York. N.B. - At Nos. 4 and 13 state if colored; if other races, specify what, At Nos. 9 and 17 state whether 1st, 2d, 3d, &c. Marriage of each. We the Husband and Wife named in the above Certificate, hereby Certify that the information given is correct to the best of our knowledge and belief.